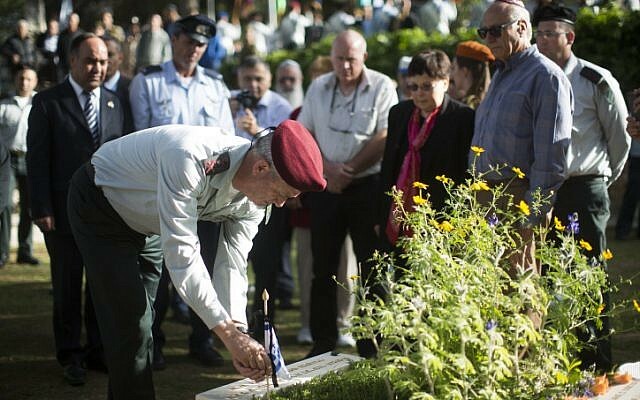 IDF Chief of Staff Lt. Gen. Benny Gantz sparked a small scandal Thursday when it emerged that he had seemingly skipped over a non-Jewish soldier’s grave while placing ceremonial flags the day before. The IDF Spokesman issued a statement saying that the procedure for the ceremony, held annually ahead of Remembrance Day and Independence Day, would be changed to avoid future snafus. The ceremony at the Mt. Herzl military cemetery has, for the last 10 years, seen the army’s chief symbolically place a flag on the grave of the last IDF soldier to have died. But in the ceremony that took place on Wednesday, Gantz placed a flag on the grave of the late Col. Shlomo Nitzani, although the last deceased soldier was actually Yevgeny Tolotzki, who died on February 17 while in basic training. Tolotzki’s body had been buried in a section of the cemetery allocated to non-Jews, which appears to be why his grave was overlooked during the ceremony. Some charged that Gantz’s omission was disrespectful toward the soldier and his family; others claimed that it also reflected a clear state-backed bias against non-Jews. The IDF said that Gantz had no intention of causing emotional distress to anyone. From now on, the chief of staff will also place a flag on the newest grave in the entire military cemetery, and not only in the main section, where Jews are interred, the army said.